On Saturday night I took my Mom out for her birthday dinner. Of course it had to be sushi! 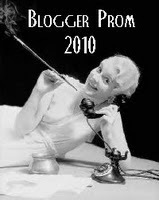 I had researched about this place and people raved about it on the internet. My Mom said that she had a nice time, but I feel kind of bad for not taking her to a better place. For me, I have mixed feelings. This place only carried the most common fishes with a few small twists to their food. Portion size was not bad, but I definitely have eaten fresher fish. The price was reasonable and the service was nice. I sat at the sushi bar and there were bottles of water at each seat. They are suppose to have a lot of alcoholic beverage, but I don't really drink so I can't comment on that. 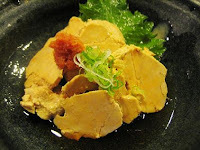 Ankimo, Monkfish Liver, that was very bland. The amount they gave was generous but their sauce was lacking flavor. I wouldn't recommend this dish. 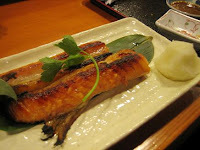 Grilled Salmon Belly was very cheap. 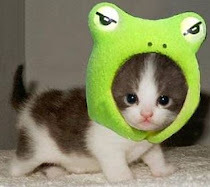 It was not what I thought it would be. 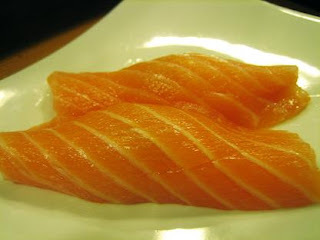 At first I thought it would be nigiri, but it was two big cuts of cooked fish. This actually had a lot of flavor and was very tender. For the price of $4.50 I think it was definitely worth it. 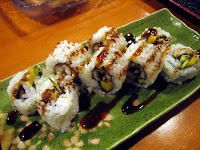 Umai Roll was an eel, avocado, & mango cut roll. I usually don't order rolls, but I can't resist mangoes and I love Unagi. This took the longest to arrive, some of the food took way longer than you'd suspect. It was good, but nothing special. The mangoes they used were actually pretty sweet and it complimented the sweetness of the eel. Uni Croquette actually tasted like Uni. I actually hate Uni, but since it sounded interesting I wanted my Mom to try it. She said that she still prefers nigiri. The croquette was very flavorful and crispy. 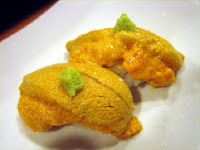 If you like Uni, I would recommend you order it. Hamachi Sashimi that had 5 generous slices. The texture of the fish was good, but the color was questionable. It didn't taste fishy, but I could feel that it wasn't the freshest fish around. It was decent enough that I ordered a second order of sashimi and one order of nigiri at the end. I will also provide an idea of how much wasabi I eat with my sushi. Ama-Ebi took a long time to come out. It was a little fishy tasting, but still sweet. I don't think I would order this again here. 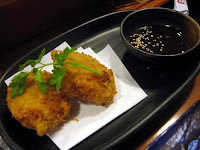 They fried the heads and I asked for Ponzu sauce, but I think their Ponzu sauce lacks flavor. Overall this dish was a let down. Sake was only average. I thought they would prepare it differently, but it was just regular nigiri. Not fishy and a generous cut. Albacore was delicious! I actually really liked the way they prepared this. The cut was generous and on top they put ground radish. 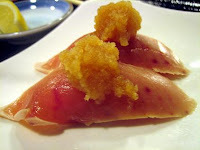 They also added a garlic Ponzu that truly brought out the flavor of both the fish and the radish. It was a simple but splendid combo. I ordered this almost 4x. Uni was surprisingly great! Like I have said, I despise Uni almost with a passion. I ordered this for my Mom and she forced me to have some. The Sushi Chef advised that no soy sauce was to be used with this and that made me curious. This dish was what changed my mind about this place because they turned something I hated to something I might like now. Their Uni was very fresh and had a lemon twist. It was pure flavor basically because there was no soy sauce and only a small piece of wasabi on top. I would definitely recommend people to try this, but fair warning that it was at Market Price. For sushi lovers out there, you know that means it would not be cheap. All in all the place was decent and at a reasonable price. I would recommend people who just want some cheap sushi to satisfy their craving, but do not come if you are hankering for spectacular sushi that would blow your mind away. One thing that upset me was that they didn't have Toro, which was on the menu. They also ran out of Hotate, which really upset me because they took forever to make certain parts of our order that I missed out on this. I wonder if it was flavored differently since they ran out, it must be popular. Overall I will come back to take my sister here to try the Uni, but this place probably won't be somewhere I'd regularly come back to visit. A redeeming quality was that they had fresh wasabi, but watch out for the fake wasabi they also serve. Alas, my search for wonderful & reasonable sushi continues.